Our Story - Carousel of Light Inc. When Lance Shinkle's daughter, Chelsea was just a little girl, he illustrated and wrote a book for her about a carousel horse named Jingle Bell. The father would take the daughter to visit and ride her favorite horse every week. One day a little boy beat the little girl to Jingle Bell and was too rough with the horse breaking off one of Jingle Bells wooden ears. The owner of the carousel was going to replace Jingle Bell and the father and daughter found Jingle Bell in a pile to be thrown away. They took Jingle Bell home and together worked on Jingle Bell so the horse was as beautiful as ever. The carousel owner was so thrilled with Jingle Bell he put the horse back on the carousel and gave the little girl a golden ring to wear so she could ride Jingle Bell whenever she wanted. 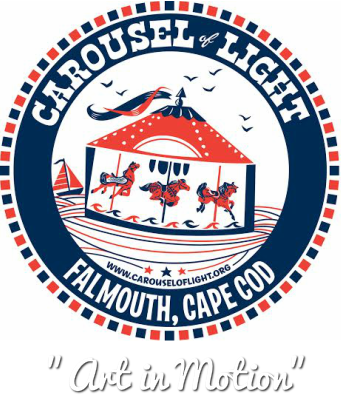 Chelsea loved the book so much that her Dad, a local Cape Cod sign carver and artist began to create his opus;The Carousel of Light. Lance’s shining masterpiece, is now a hand-crafted and meticulously painted carousel, each piece lovingly carved from a block of wood and transformed by a man’s vision, passion and gift into elaborately decorated horses and other elaborate and colorful segments of this beautiful orchestra of amusement. 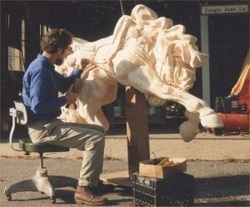 Lance began the task of hand-carving each horse in 1988. The creative process begins with an original drawing by Lance,which is transferred onto a set of wooden planks, each plank a cross section on the horse. Lance devised the carving system to achieve animated forms and greater strength.The planks are laminated together to create hollow block of wood in the rough shape of a horse. A chain saw is then used to carve out the contour. The figure is finished with hand chisels and sandpaper, and the horses were color-dyed and painted. Lance has created 20 horses, two wheel chair accessible chariots and three ornamental sculptures. 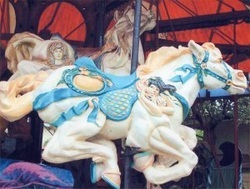 He has painted 12 colorful scenery panels to decorate the carousel. 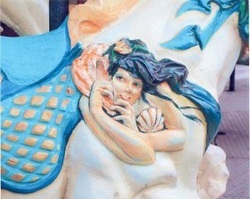 The nautical-themed carousel includes sea horses, mermaids and fishing nets in the same windblown style of the horses and chariots. The carousel debuted in July 1993 at the Barnstable County Fair. After, it was displayed throughout Cape Cod to rave reviews from children and adults alike. Lance moved to California in 1999 to be with his ailing father and took the carousel with him. After his father died in 2009,Lance returned to his home in Falmouth.In February of 2013, Lance shipped the carousel back to Falmouth. Lance has donated his masterpiece to the Carousel of Light, Inc.
A white stallion rides to the rescue!